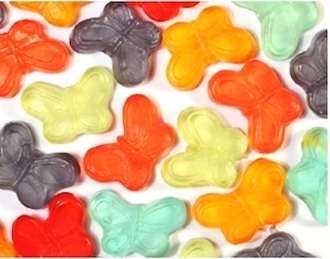 Mini Gummi Butterflies 20 Lbs. Mini gummy butterflies in 6 assorted flavors cherry, orange, grape, watermelon, blue raspberry, and green apple. These gummi butterflies are very colorful with great taste making this the perfect frozen yogurt topping. *Gummi's are Produced in a Plant which Processes Peanuts, Tree Nuts, Soy, Wheat, Milk Products.